Image: Jesse Allen, using data from the Land Atmosphere Near real-time Capability for EOS (LANCE). Hordes of gypsy moth caterpillars are currently ravaging parts of the Northeastern United States. Newly released images from space show the alarming damage being done to New England forests by these leaf-munching insects. Incredible as it may seem, insects and disease damage 45 times more forest area annually than wildfires. A single caterpillar or bug can’t do much damage, but it’s a different story when they number in the millions. Collectively, they’re a true force of nature. 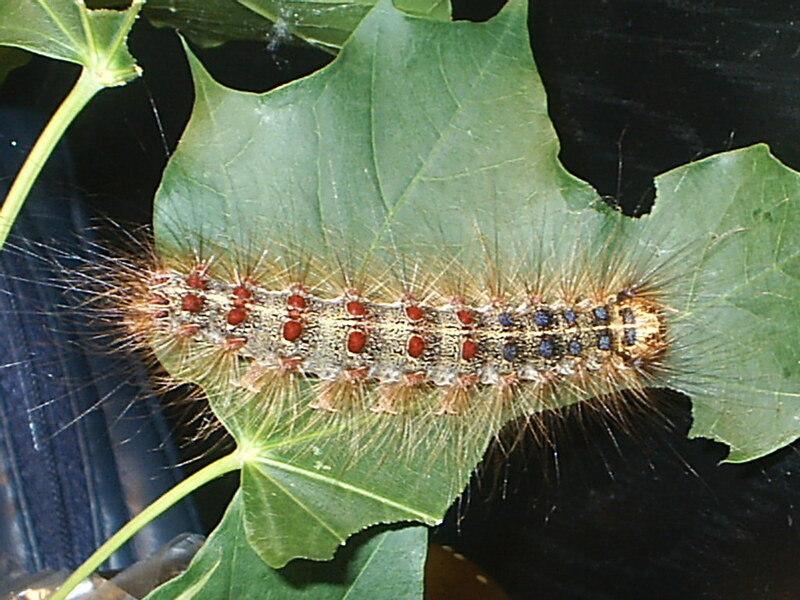 Parts of New England and the mid-Atlantic states are witnessing a population explosion in European gypsy moth caterpillars, an insect that was introduced to the region in the 1860s. Soon after hatching in early summer, these bugs start feasting on the leaves of deciduous trees. 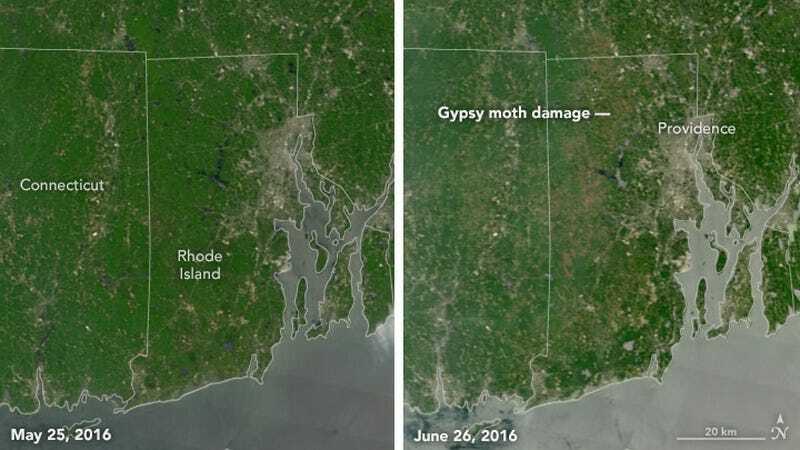 Newly released satellite images show the extent of this defoliation in parts of Rhode Island. In the image below, healthy forests appear green, while the leaf-stripped areas feature a gray-brown tint. Left: Parts of New England on May 25, 2016. Right: The same region a month later. (Image: Jesse Allen, using data from the Land Atmosphere Near real-time Capability for EOS (LANCE). The image below shows a closer view of forests near Barden and Scituate Reservoirs in western Rhode Island on June 30, 2016. The remaining green patches belong to coniferous trees trees, which the caterpillars avoid. Ecologists partly attribute the infestation to a decline in population of white-footed mice (a key predator of gypsy moths), which has shrunk in recent years owing to poor acorn production by oak trees. But the true culprit driving the caterpillar boom are the drought conditions currently ravaging the region. Dry weather tends to holds back pathogens that normally keep the caterpillars in check. It looks awful, but the effects of this infestation aren’t terrible—at least not yet. Trees can survive one or two years of defoliation by caterpillars. But should this continue for the next three or more years, that would be a different story.